Monday morning after having landed in Rome’s Ciampino Airport, Aug. 26, 2018, Pope Francis traveled to the Basilica of Santa Maria Maggiore to offer thanks for his two-day trip to Ireland, for the occasion of the World Meeting of Families. Then, unexpectedly, he made a detour to the Church of St. Augustine in Rome’s Campo Marzio neighborhood, to visit and pray at the tomb of Augustine’s mother, Santa Monica, whose Liturgical Memorial falls today, Aug. 27, 2018. 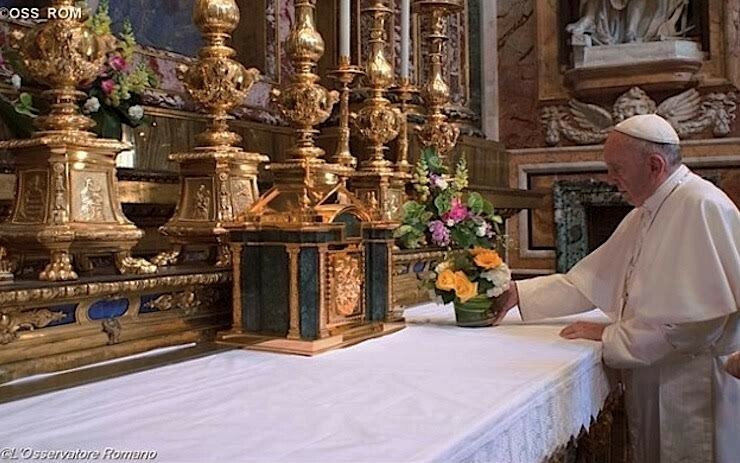 According to a note from the Holy See Press Office, the Holy Father made his usual detour to go to the Marian Basilica, where he always venerates the icon before and after his international apostolic trips. During his time inside, Francis prayed before the ancient image of Mary, Salus Populi Romani, in silence for several minutes. Then, Francis made the unexpected stop to the other little Roman Church steps from Rome’s Pantheon, where St. Monica’s relics are kept in the little chapel, to the left of the main altar.